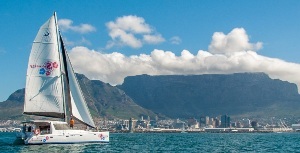 Serenity One Sailing Catamaran Boat Charters Cape Town. SERENITY ONE CATAMARAN BOAT CHARTER. Serenity One: A state of the art modern Sailing Catamaran. Great for: parties, functions, sunset cruises to Clifton or Table Bay, staff parties, Atlantic coastal scenic tours, braai (barbecue) cruises, bachelor/ette parties and birthday parties. Serenity One is licensed to carry 40 passengers. SAMSA certified. 40ft Sailing Catamaran Yacht Charter. Catering and bar facilities. Powered by Twin Yamaha 55 HP Diesel and Full Sailing Rig. R17 600 two hr. minimum at sunset. Braai (Barbecue), Buffet, Finger snacks and platters.... or bring your own meals. Cash Bar that stocks: beers and soft drinks in cans or bottles only. You may request coolers and ciders as well. Supply your own drinks and the use of bar facilities. R750 per hour.